any volume to be added before reading th eplate? would the cells not dry out? The lab confirmed that the protocol is not very clear in that part you pointed out. We will update the protocol shortly. You should add 100 uL of the 1X buffer to the plate after washing - to prevent the cells from drying out. Custome rkindly contacted us to inquire whether they may be able to use this kit to determine membrane potential and then follow up with flow cytometry staining. Will the dye remain for the 3-4 hours needed to perform the flow cytometry? Would the kit interfere with 405 or 633 fluorochromes? 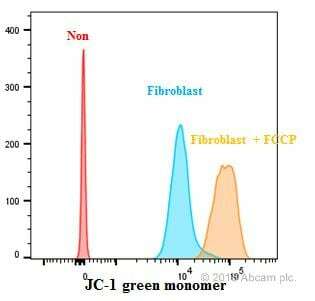 Looking at JC1 staining it appears that flow cytometry would be possible to perform as long as the cytometer is capable of the proper excitation/emission required. Protocol booklet mentions on Pg 5 that Excitation = 540 – 590 nm and Emission = 570 – 610 nm and on Pg 12. Set excitation wavelength at 535 ± 17.5nm (aggregate excitation only) or at 475 ± 20nm (for simultaneous aggregate and monomer excitation) or to Set emission wavelength at 590 ± 17.5nm (aggregate emission only). If reading of the monomer species is also desired, set a second emission reading at 530 ± 15nm. Looking at the protocol booklet pg 12 step 4. 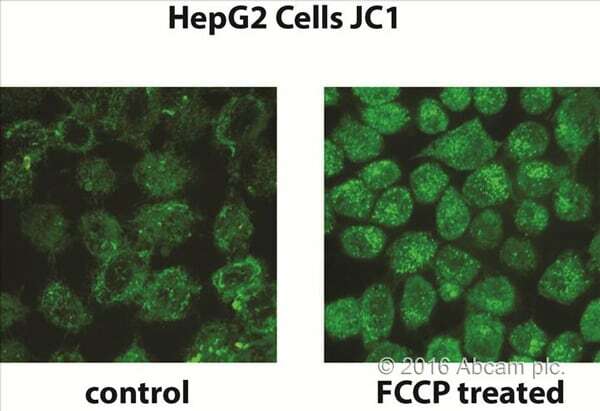 FCCP treatment for 4 hours is recommended after JC1 staining to observe a decrease. So the dye appears to be detectable for at least 4 hours. The JC-1 aggregate can be detected with similar settings to those used to detect rhodamine (excitation/emission = 540/570nm) or texas red (590/610nm). This may interfere with 405 or 633 fluorchromes, although you should check via a spectra graph for the specific fluorchromes to see if compensation may solve any interference. is fixation with PFA in well possible (after live imaging, for storage)? If you wanted to keep the relation between JC-1 dye and the detected mitochondrial membrane potential after fixation this is not possible. 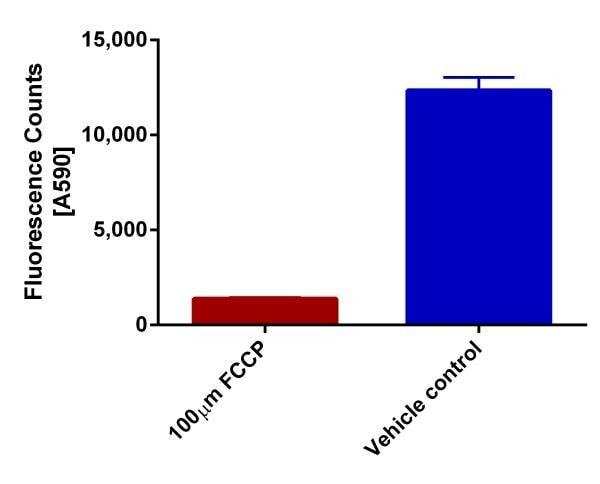 This is because JC-1 is dependent on mitochondrial membrane potential which will be abolished by the fixation. I am using primary cells and am afraid that 10 minutes without media is too much. Can I mix the JCI with media rather than buffer so my cells aren't affected? Thank you for contacting us. It is fine to go ahead and use media without phenol red instead of buffer. Please let me know if you have any further questions. 2. 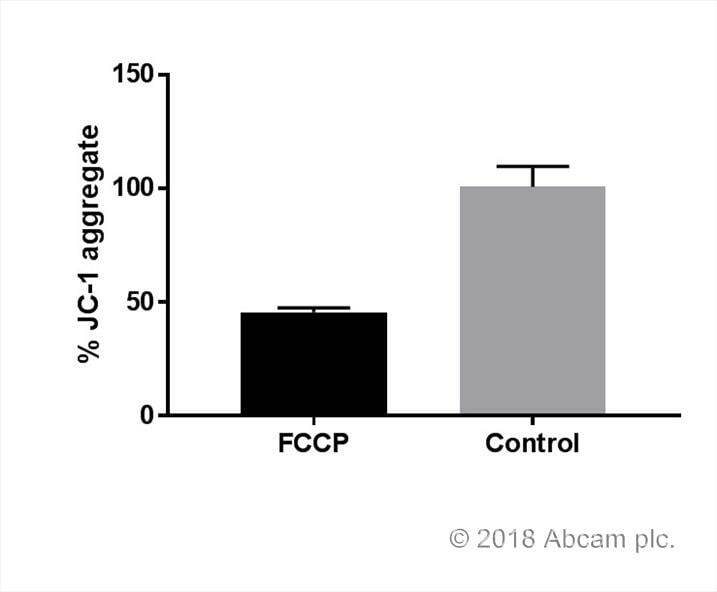 Is this kit designed to do a cell treatment before or after JC-1 incubation? Or does it matter? The most important thing with the protocol is to read membrane potential in the presence of compound (or treatment). The reason is that we have found in our experience that changes in membrane potential can be reversible as soon as the treatment is removed from the cells. The easiest thing to do this is to stain first with JC1 and then treat (ideally short treatment). If they can do this, then they could follow the protocol as shown and then simply do the treatment in the absence of FBS. If they do it the way around and treat first and then stain w/o the FBS they run the risk of not finding the true effects of the treatment due to reversal during the staining and washes following the treatment (unless they stain and wash in the presence of the compound). I just bought a JC1 - Mitochondrial Membrane Potential Assay Kit (ab113850). The protocol said it can be used for 100 times, but I find that if follow the protocol steps the 1*buffer solution will be used up very soon.Can I use PBS or some other buffer to replace the 1*buffer solution for JC-1mix?How to storage the 1*buffer solution,4℃ or -20℃?Waiting for your reply. The kit contains enough buffer to perform 100 tests. 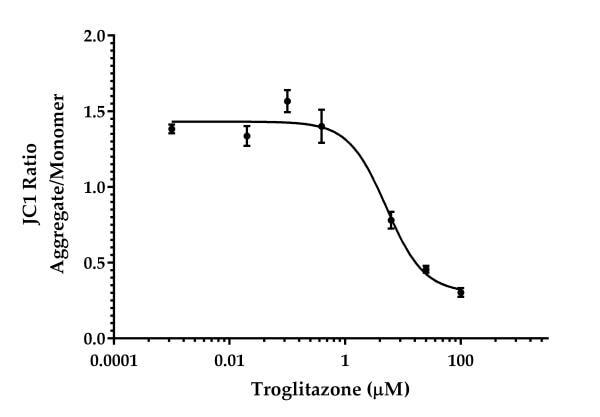 We give 10mL of buffer at 10X which should give a total of 100mL of buffer at 1X (20mL are used to dilute compounds for toxicity assays, 10mL are used for diluting JC1, 15mL are used for washing after JC1 staining and resuspending the cells). Following the protocol, you should not have to use more than 50mL of buffer. You could also use the media without phenol red to resuspend the cells and dilute the compounds.